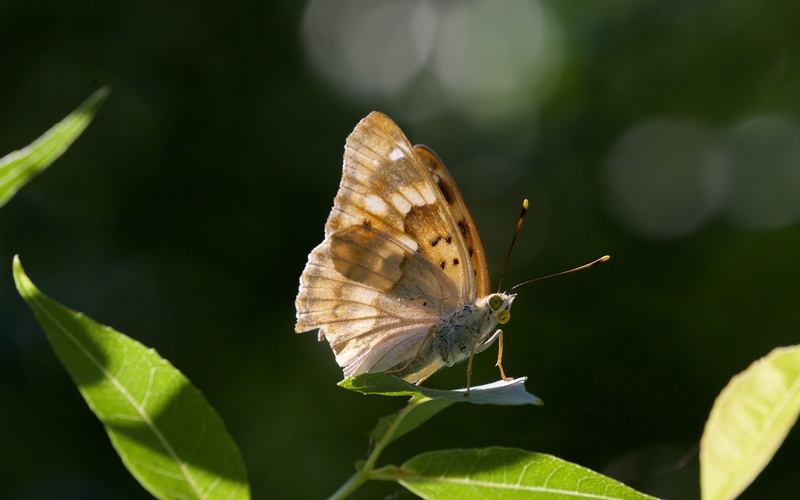 If Freyer’s purple emperor (Apatura metis), or FPE for short, is abundant around Lake Skadar as I think it maybe, having found a handful of territories at Vranjina and knowing that its food plant, white willow (Salix alba), is very commonly distributed around the wetter areas of the lake, then an easy test is to go somewhere other than Vranjina on the edge of the lake and walk a transect and hope that FPEs are on every other white willow branch. The test is simple to conduct, repeatable and eminently falsifiable. Žabljak Crnojevića is the old fortified town on the northern edge of the Lake and adjacent to the Morača River. 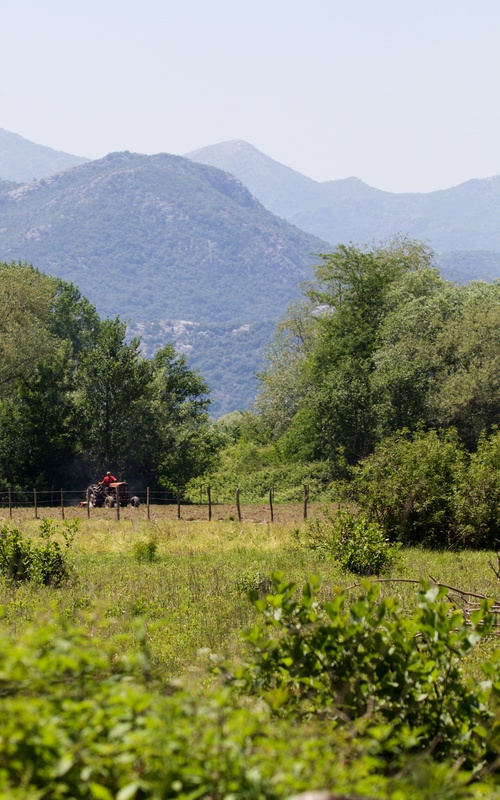 There is a hiking trail to the fishing village of Dodoši that runs across the water meadows and the route provides a good survey site well away from Vranjina. If needs be, I can also survey the riverside if nothing is forthcoming in the water meadows since the species is said to prefer habitats close to running water. Water meadows around Žabljak Crnojevića. Today is hot and it is midday, perhaps a little late for an FPE survey since there is some evidence to suggest that they stop flying in such sweltering conditions. Frustratingly, I miss the path and end up doing a circuit of the base of the ancient hill fort. However the path runs by the village houses and then round the back of the fortified town and this is, by chance, a wonderful detour. 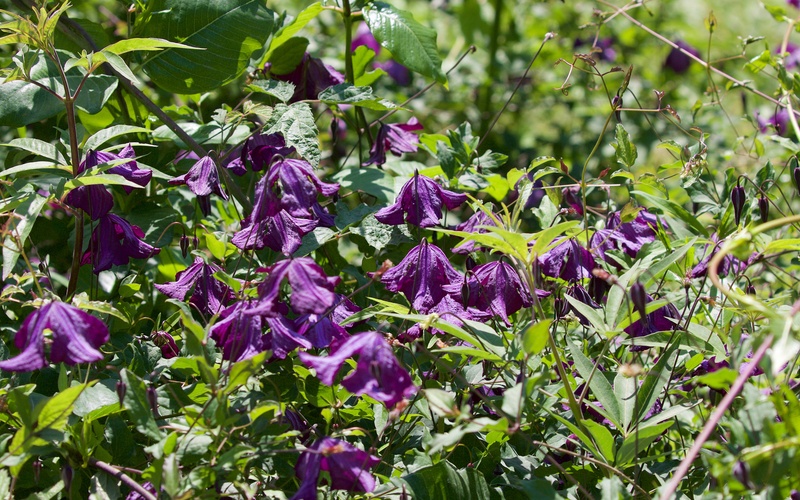 The deep purple of the wild clematis (Clematis viticella) is attractive and grows in every hedgerow I pass; then a fritillary launches from the path in front of me and disappears over the clematis hedge. Wild clematis running through the hedgerow. The houses, all built square from reinforced concrete but with elegant upper balconies, have lovely gardens all given over to vegetables but with red and pink rose bushes in full flower and hydrangeas in bud along fences and paths. Dogs bark as I pass but don’t have the energy or courage to snap. By the stream, there is a fleeting grass snake (Natrix natrix) and a not so fleeting striped hawk-moth (Hyles livornica), which is mesmerising as it feeds in a blur of wings. As I return full circuit, a handful of nettle tree (Libythea celtis) butterflies, presumably the summer brood, are taking salts from the path next to the river. 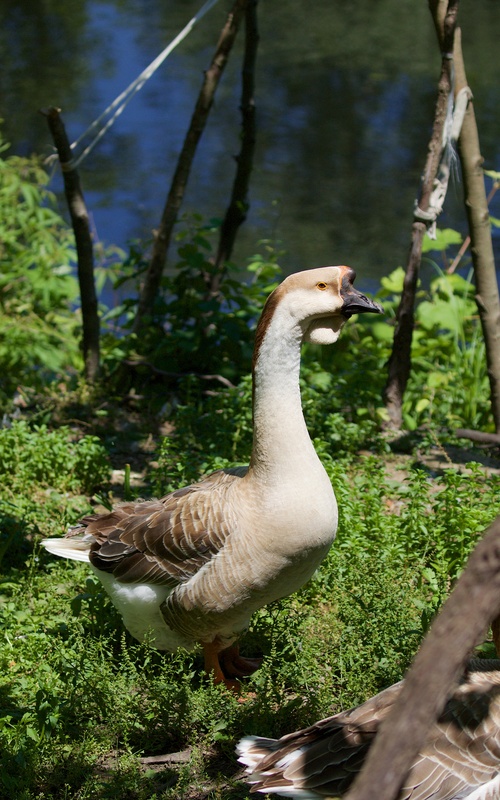 The domestic geese stare but do not gaggle and I admire their ugliness and poise. 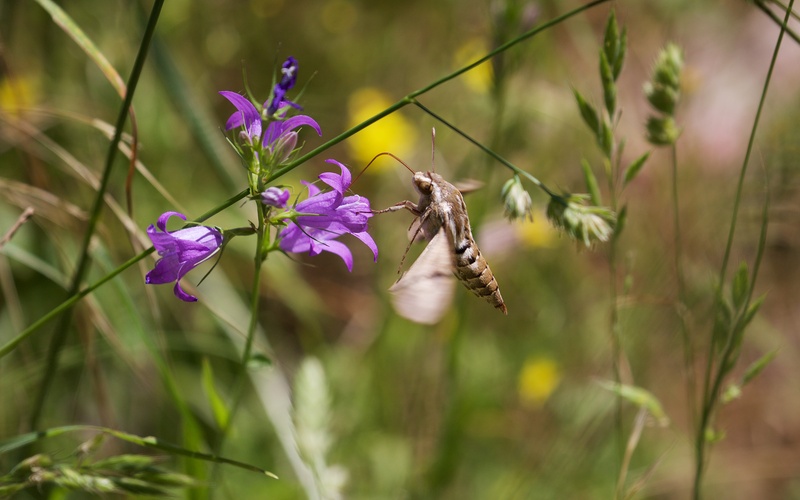 Striped hawk-moth on rampion bellflower (Campanula rapunculus) and nettle tree butterfly taking up salts. 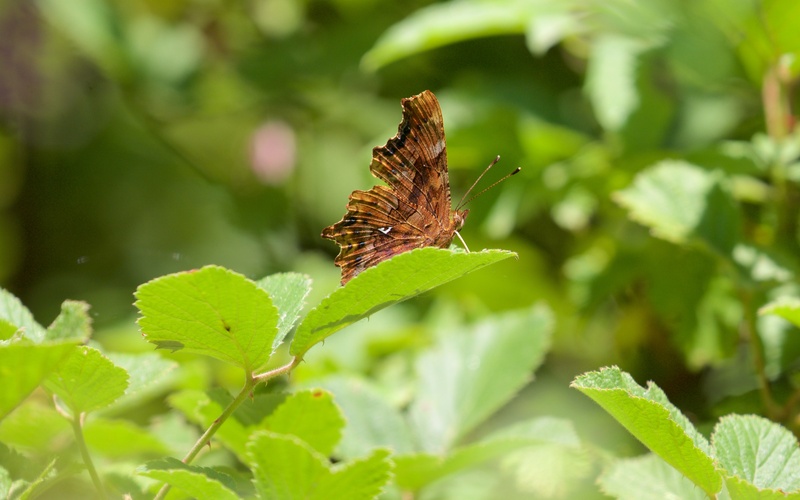 Once the right farm track is found, I almost tread on another large fritillary and it too dashes away and is lost; then a comma (Polygonia c-album) flashes orange, fresh and bright on the edge of a puddle and its flits to the hedgerow and perches in the sun. 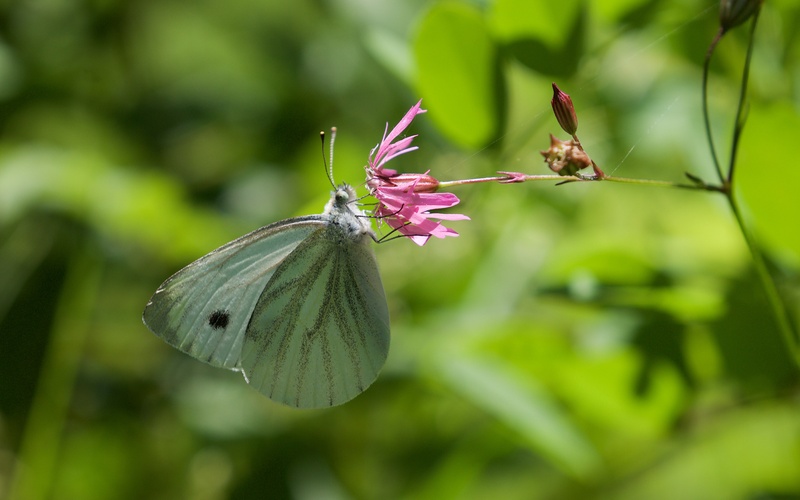 Large whites (Pieris brassicae) and green-veined whites (Pieris napi) are also on the damp ground and nectar feeding on flowers. Comma and a green-veined white butterfly on what is now ragged, ragged robin (Lychnis flos-cuculi). 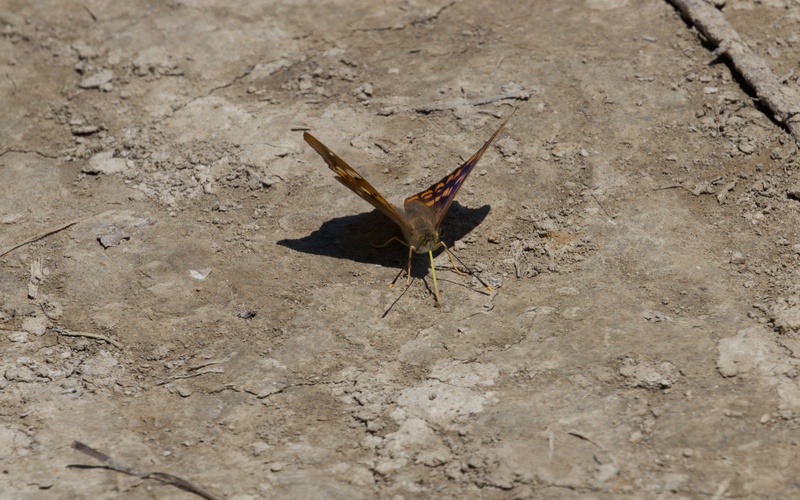 Then a purple flash and an aggressive circling of a large butterfly and I have FPE No. 1. 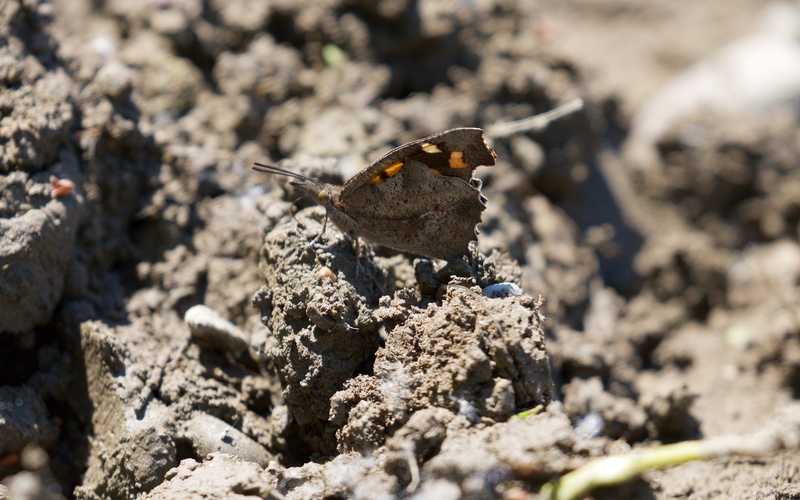 This is a muddy puddle in the shelter of an overgrown field boundary and the butterfly flies up to a lookout perhaps 3 m off the ground. The next field boundary puddle perhaps 100 m across the field has another FPE and then another. 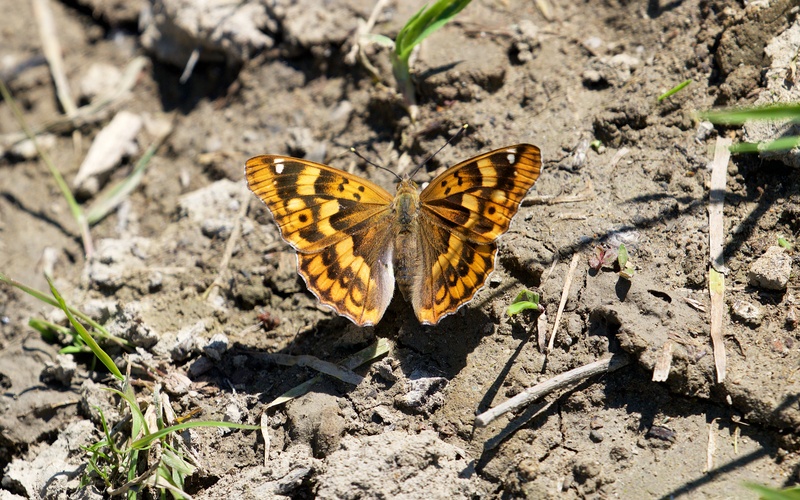 In around 3 km of walking the farm track, aided by helpful directions from a friendly and smiling farmer rotovating a field, I think to plant with maize, I had at least nine territories including three on a sunny and open section of track across the, now totally dry, water meadows. 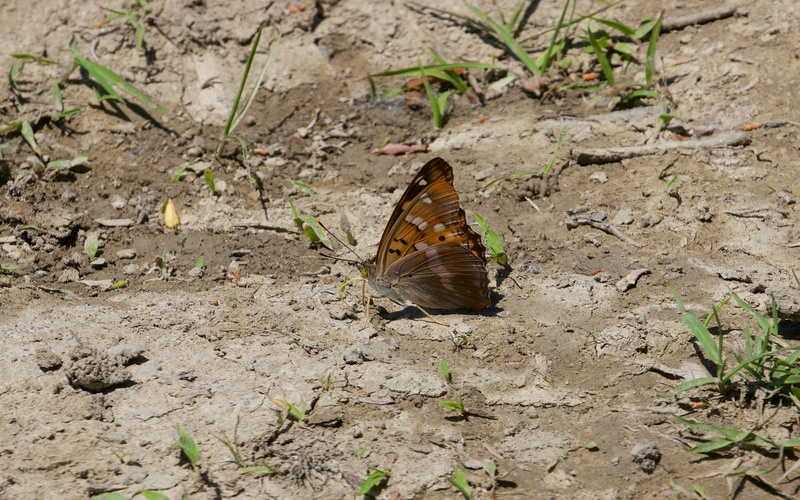 This was the commonest butterfly out here! I was hot in the midday sun and returned to the shelter of the hedgerows and then the large poplars in the village square, accompanied by the early summer sound of singing nightingales and golden orioles, occasional cuckoos and a scratchy sedge warbler. 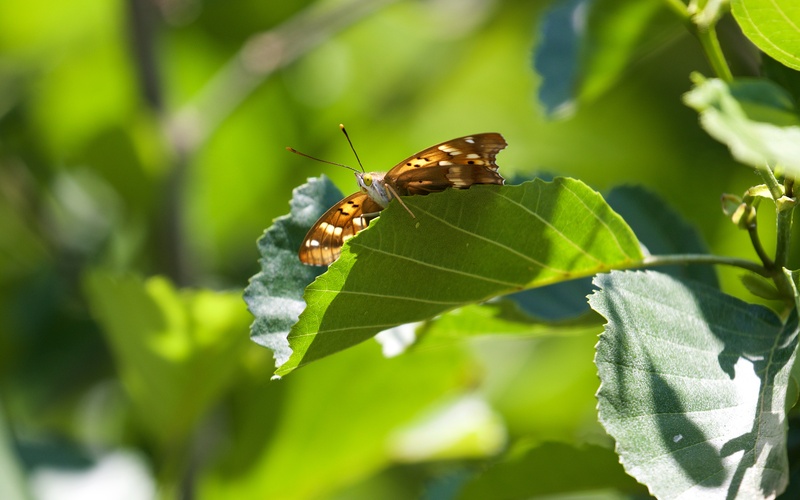 Some of the nine Fryer’s purple emperor at muddy puddles, dry farm tracks, and sitting above muddy puddles and farm tracks. 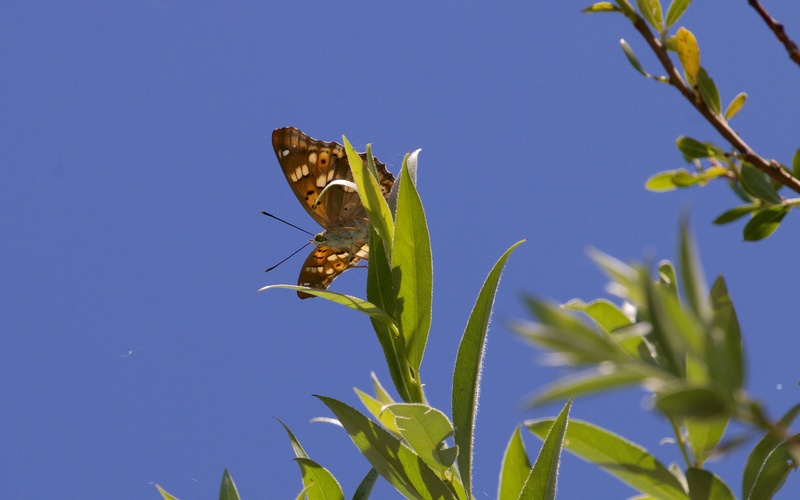 This little piece of Žabljak data along with the Vranjina records does suggest that this wonderful butterfly species truly is common around Lake Skadar and, given the extent of the willow habitats, that there is likely to be a large and important population. 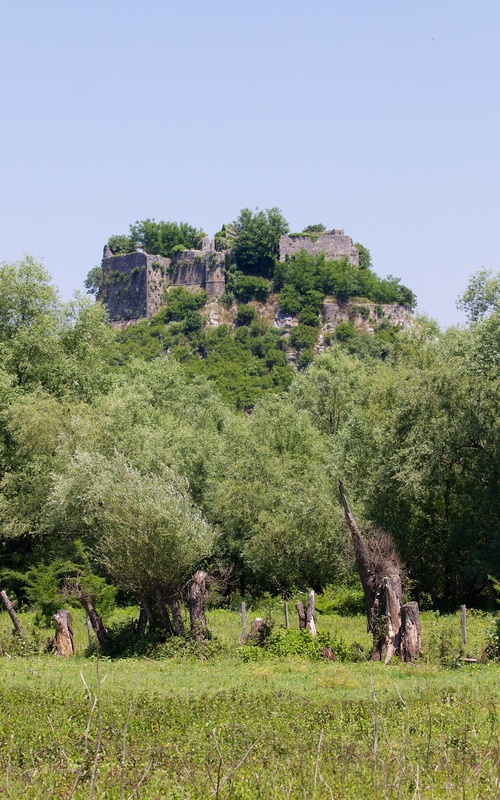 I just need to visit other Lake Skadar sites and then Lake Šasko and the Bojana river…I very much hope others will go hunting the emperor soon. The friendly farmer at work.